Visit eight states and see America's original line that helped build the west. Filmed by 14 different people over decades. Learn about E. H. Harriman's dramatic life and how he eventually put an empire together that resembles today's merged UP lines. Follow the Harriman 1900 era to modern times from the phase out of steam to first and second generation diesels. The focal period is from 1960 to 1980 with the onslaught of rail mergers. See steam GP9s, E and F-units, Turbines, DD35, DD40s, U50s, SD24 and SD45s and many others with passenger and freights. 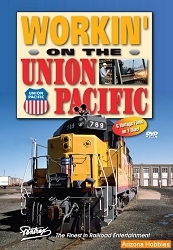 To quote S Gaugian magazine, "In Union Pacific Vintage West, we get a comprehensive overview of the Union Pacific's history, motive power and operating style. Filmed by 14 different photographers, the footage is extensive and interesting. In all a real treat." Charles Smiley Presents, 1 hour 38 minutes.